The Comet sank after a collision with the schooner Exchange. After following the mooring line to the concrete block on the bottom, you proceed to the Comet by following another rope. This line, will lead you across some broken decking and debris. The decking points the direction to the main attraction of this site. This is of course the 22 ft. tall paddle wheels. Almost dwarfing the wheels are the massivewalking arms. The arms transmitted the power to the paddle wheels. You can inspect the drive system by following up the center of the A-arms to the top. Then proceed downto the connection to the wheel. The hub has pulled slightly away from the deck. 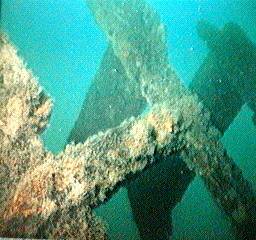 This provides a great veiw of how the paddles were fastened to the ship. There is some limited penetration possible. Only divers comfortable with overhead obstuctions should venture under the decks. If you have time after checking the drive system, a tour of the perimeter will reveal part of the cargo among the debris. This dive has excellent photographic potenial.